St. Daniel in the lions’ den is one of the best known stories from the Old Testament Book of Daniel, dating from the 6th century B.C. After the people of Judah were taken captive by King Nebuchadnezzar, Daniel and 3 others were placed into service of his court. Daniel excelled as a visionary and prophet. King Darius’ reign followed, and though he loved Daniel, was tricked into an edict that no one but himself in the kingdom was to pray for 30 days. Daniel was caught praying and sent to the lions’ den. In the morning the King arrived to find that the Lord of Daniel had closed the lions’ mouths and he survived. He declared Daniels’ God the living God of the land. 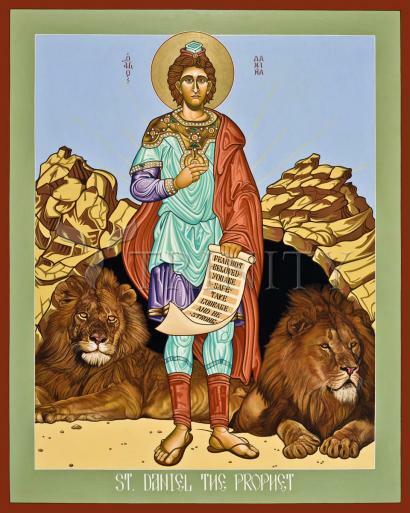 In this icon, he carries the scroll with a quote from Daniel 10:19, to bolster all the strength of all his church. On his head, in the Jewish tradition, he wears a phylactery, with Old Testament prayers inside the box. This icon, a commissioned work, was lovingly dedicated to the Church of St. Daniel the Prophet in Ouray, Colorado in hope that we, God’s children, know we are always loved and held safe, and into a challenging world we may serve our Lord with courage and strength.